The Securion printer is the best solution for personalizing and laminating secure cards at customer-facing counters. It caters to the growing need for security and fraud control and produces cards that will last significantly longer. 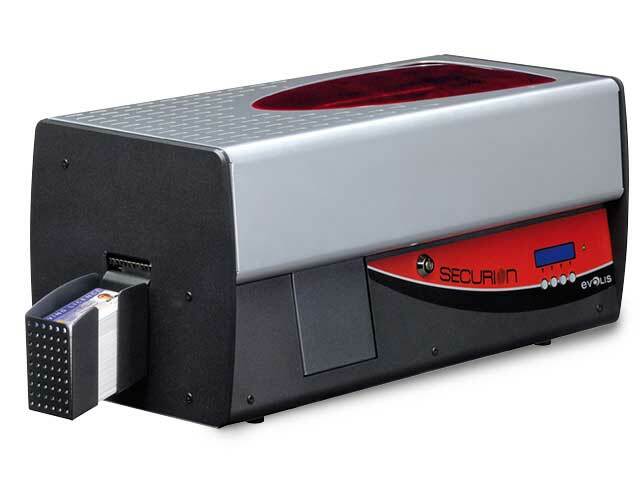 Securion comes with a color print module and a laminating station, both operating in dual-sided mode. It takes just one pass to print, encode and laminate a secure card. With its one-of-a-kind lamination station, Securion durably protects your secure cards. The printer applies any type of film over the entire surface of the card - from simple varnish to patch films with ultra-high security custom holograms - for premium protection of your cards. Your cards will last foryears with virtually no wear and tear. The Unichroma™ ribbon used with Securion makes it possible to use direct-to-card printing on polycarbonate (PC) cards. These extremely strong cards are used for sophisticated applications requiring a high level of security. The combination of a Securion printer and Unichroma™ ribbons offers an economical solution for issuing secure polycarbonate cards. Thanks to the centralized locking system that prevents access to consumables (ribbons, films, blank cards, rejected cards), password protection as well as a Kensington® security slot, your Securion card issuing system is safe and secure.